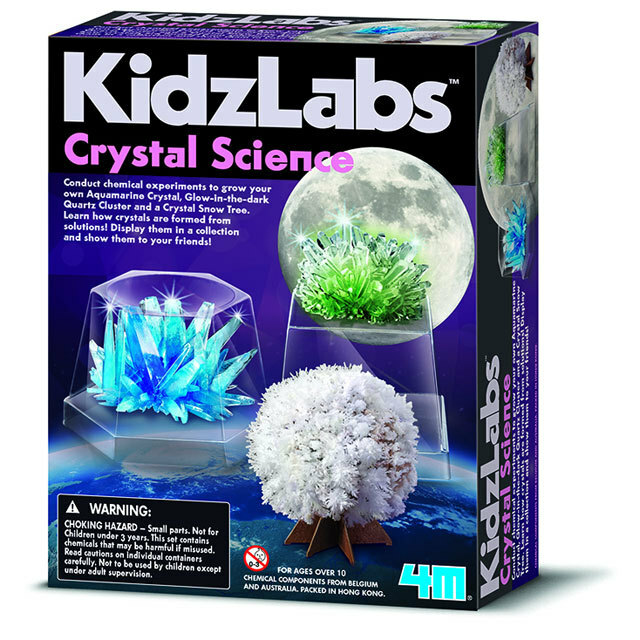 Kidz Labs Crystal Science | Conduct exciting crystal experiments! Assemble your own Crystal Snow Tree! Your Kidz Labs Crystal Science kit is a fantastic science kit that your children will love to experiment with! It gives them the opportunity to conduct basic chemical experiments such as growing their own Aquamarine Crystal, Glow in the Dark Quartz Cluster and a Crystal Snow Tree! In doing so, your children can learn how crystals are formed from solutions, and display them in a collection to show and explain to their friends! A great kit for any child who loves science, crystals or simply creating something a little bit special! - A stirring bowl, spoon, set of crystal snow tree paper and detailed instructions. Also required but not included to conduct your experiments are a jar of hot steaming water, an apron, protective goggles and rubber gloves. Boxed dimensions: 21cm (l) X 16.5cm (w) X 6cm (d).